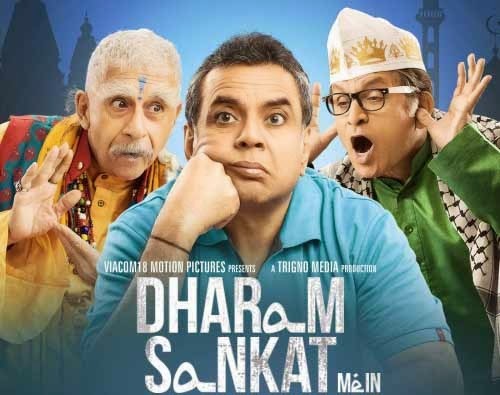 Mumbai : The official trailer of the upcoming Bollywood movie Dharam Sankat Mein Trailer is revealed by makers, features Paresh Rawal, Annu Kapoor & Naseeruddin Shah in the humorous role. The upcoming movie is directed by Fuwad Khan and produced by Shariq Patel, Viacom18 Motion Pictures, and Sajjad Chunawala together. The trailer features an interesting dialogue that- "Dharam Koi bhi ho, topi sabhi pehna dete he." The story of the comedy flick revolves around a Hindu man played by Paresh Rawal, who goes through an identity crisis. Paresh discovers that he was born to a Muslim family and he was adopted child. Annu Kapoor is playing the role of Mehmood and Naseeruddin Shah is playing Neelanand Baba in the movie. The story of the movie is all about of Paresh Rawal and his journey to find his real father. The upcoming Dharam Sankat Mein movie features the ace Bollywood actor Naseeruddin Shah in a never seen before avatar. The movie is all set to release on April 10th of 2015.